With over 430 bird species documented in Alabama, there’s more to see here than you can imagine! 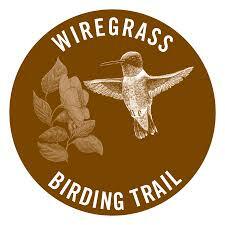 Landmark Park is an official site on the Wiregrass Birding Trail. Birding opportunities can be found throughout the park. The park has three major sections for birding: the upland farm and village section, a middle ground that contains upland hardwood forest with multiple walking trails, and a lowland section that features an elevated boardwalk around a wetland and through a heavily wooded bottomland. From the main gate, the visitor encounters a small family farm, complete with farm house, outbuildings, and several patches of crops. Just beyond is a row of historic buildings that form a sort of 19th century “main street” for the farm village. This farm-and-village portion of the park is home to a mix of birds, mainly year-round residents in the warmer months. In winter, you may find interesting sparrows (Vesper and Savannah, as well as Song and White-throated) in the plowed-over fields. The most productive and rewarding birding is likely to be achieved by walking the wooded edge along this open part of the park. You can see a full range of seasonal songbirds in this manner, as sightlines are quite good here. The upland woodlands section of Landmark Park is anchored by the park’s nature center, featuring a variety of interpretive displays. Wooded trails begin at this point and wind through the predominately hardwood forest. This can be a productive site for spring and fall migrants, particularly behind the passing of a weather front. The foliage here is quite thick, so knowing bird songs is the best way to effectively work this area. An extensive wooden boardwalk winds through the lowest areas of the park. It is presently a wonderful place to observe successional growth of wetland plants, such as Buttonbush, Summersweet, and Tag Alder, but the density of the undergrowth makes it a challenge to see the birds. Click here to download a printer-friendly Field Checklist of Birds at Landmark Park. For more info on Alabama’s Birding Trails, click here.